Lancaster, MA – November 21, 2017 – (GuitarPR) – After an initial introduction of an earlier version in 2015, GUITAR-JO is launching its newest Banjo Simulator for electric guitars via Kickstarter. GUITAR-JO 2.0 has been completely re-engineered from the ground up to create a first-of-a-kind electric guitar accessory that effectively simulates banjo sounds. With the Kickstarter campaign winding down, the window for early adopters is closing rapidly. Supporters can be among the first to acquire GUITAR-JO 2.0 through special rewards opportunities before it is available to the general public. But they’ll have to hurry. 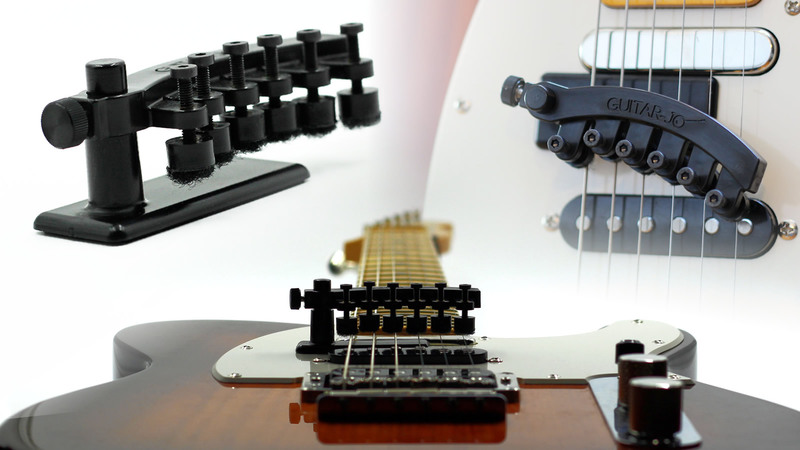 GUITAR-JO 2.0 is designed and built in the USA, and utilizes 6 individual dampening pads that can be adjusted to make a small amount of contact with each string. When the pad material comes into contact with the string, it alters the timbre to give it a twangy banjo sound. This solidly built accessory attaches to any electric guitar with a flat surface. The bottom of the mounting foot consists of microsuction material, which employs thousands of microscopic air pockets that create partial vacuums between the material and the guitar’s surface. It offers a strong hold without leaving any sticky residue. To disengage GUITAR-JO 2.0 without taking the device off, you can just loosen the side screw, rotate the main body out of the way, then tighten it again. Watch a video and get more information about GUITAR-JO 2.0 on Kickstarter at: https://www.kickstarter.com/projects/jlangberg/guitar-jo-20-simulate-a-banjo-with-your-electric-g.